Last Sunday I decided to once again attempt to bond with my fellow Italian-Americans. Now, ever since my Italian father passed away I have lamented about the extreme sense of void in my Italianita’. The next best thing I could try would be to identify with the actual Italian American that I in fact am. When my Babbo was with us, I felt so much more like an Italian. The phone calls to and from Italy, the Serie A matches on TV, La Repubblica on my kitchen table every day pretty much sealed the deal for me. I was almost there at “tutta via”; alas over this past year I have slipped more and more back to my inevitable “mezza via” status. I do realize however that this is not necessarily a bad thing. I mean as I’ve said before, my Italianita’; whatever degree of it I am experiencing, is and always will be of the utmost importance to me. My mother’s cousin, a pillar of Italian-Americanism in his community of Fordham/Little Italy in the Bronx had invited her to come up to a feast the neighborhood was having on Arthur Avenue. He owns a little business on the avenue, and has long been a well liked and respected member of the community. Like many others, he no longer lives in the area, but has been able to maintain strong ties with other merchants, as well as the few older Italians/Italian Americans still living there. My mother was excited to see her cousin, and to check out the old neighborhood. My mother, born in the Bronx to Italian parents, left there before she even met my Italian father. I remember her always being so proud of the area. The kinship, the feasts, the grocery stores, the bakeries etc. My parents were married at Our Lady of Mt. Carmel Church on 187st, the quintessential Italian-American parish. At that time a bastion of Italian-American solidarity, a core of a community so strong it seemed invincible. Naturally I was also curious. I wanted to see my cousin, and I wanted to see the old neighborhood. I had visited often when I was little. My parents would do their bi-weekly shopping excursion. I remember my favorite stop, the record store. My parents would buy the latest Italian 45’s and we’d go home and listen to them over and over. Pepino di Capri, Gianni Morandi, Mina, Milva, and numerous others that escape me now. She knew my father missed Italy, and I suppose this was the best she could do for him on their limited income. My brother and I became so familiar with these Italian tunes, we would sing them on our street in Queens, we’d even invite the Irish kids to come on over and sing “L’Arca di Noe” (il cane,gatto,io e te…)with us, we loved that song! And so my husband, daughter, mother and I headed over the bridge and met up with her cousin at this feast. It really was a celebration of community, albeit a now scattered community that just happened to physically be in the same place that day. Many of the old stores are still there, selling their “proud to be Italian” wares and their authentic foods. Cousin John pointed out that not many Italian-Americans live in the area anymore. They do often frequent the neighborhood, eating in the restaurants, hanging around the cafes and shopping the stores. The neighborhood has now become a melting pot as far as it’s’ inhabitants and unfortunately has declined as far as crime statistics, cleanliness and overall safety. Today was different however. The band was playing, the priest was praying, and the crowd was animated. They had come to celebrate their Italianess, by eating, drinking, laughing and yelling things to each other like “kay-say deech” (cosa si dice). Uh- oh, I heard that and I started regretting my decision to come. I started feeling lost again. These were the Italian Americans I had always felt distant from. I was wearing a Parma jersey for God’s sake, but I was overrun by the Yankees jerseys all around me. I had always felt more Italian than them. I read the Italian newspaper, I called my cousins in Italy all the time, I watched RAI on Sundays, but that was when my father was alive, and spread his authentic Italianess among us like the greatest gift in the world. I miss it so very much, so does my Mom. I was determined to try to fit in. To celebrate with my fellow Italian Americans. Maybe I could let them all in on the secrets of being at least a “mezza via”. So we bought some zeppoles (the fried dough balls dripping with grease), listened to the 29th version of O Sole Mio from the bandstand and drank chianti with peaches in the paper cups. It was a nice day, and I was glad to have brought my Mom to see her cousin, do some shopping and some reminiscing. As I was perusing the crowds I saw one Italian American gentleman that to me represented the human manifestation of my feeling of Mezza Via, why I would never be akin with these Italian-Americans. He was a large fellow, walking along the street with his buddies yelling to each other the only Italian words I assume he knew, ones I rather not repeat here. 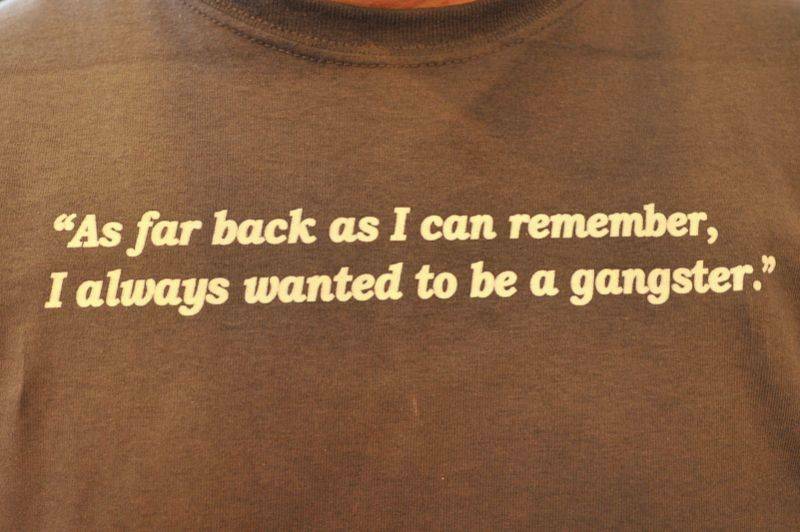 The piece de resistance was his shirt; which he actually wore proudly; it said “As far back as I can remember, I always wanted to be a gangster”. As far back as I can remember I always wanted to voice an uncomplimentary opinion about Italian-Americans that advertised things like that. Need I say more! Whose fault is it really, that we are one of the last ethnic groups acceptable to deride openly and publicly in the United States. Thanks for your help with that “gangster”.